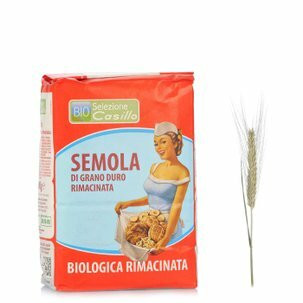 The best durum wheat semolina is selected by Selezione Casillo together with the famous master pastry chef Luca Montersino to offer only the best to those who are passionate about delicious food. This is an ideal product for making soft cakes and perfect sponge cakes. Eataly will tell you all the secrets about everything that is good! Ingredients Durum wheat semolina. Allergens: Gluten. For more information on product labels, please contact our Customer Service department. The information on the labels of the products may vary for reasons beyond our control, therefore, there may be discrepancies between the information on the site and that on the products delivered. Please always check the information on the product before consumption or use. Eataly presents Selezione Casillo, a young and innovative company that was created out of the experience of the Casillo Group, which today is a leader in processing and selling wheat. Since 1958, the Casillo Group has developed its business without losing site of the values that has always guided it: loyalty, transparency and respect, to guarantee their genuine products that represent quality and tradition.